Sihlcity is located at Kalanderpl. 1, 8045 Zurich, Switzerland; +41 44 204 99 99; visit their website, and learn about its History and Architecture. 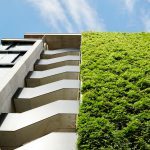 Watch the 3:19 Sihlcity Shopping Centre – Project of the Week 5/21/18 video from Greenroofs.com on the greenroofsTV channel on YouTube. 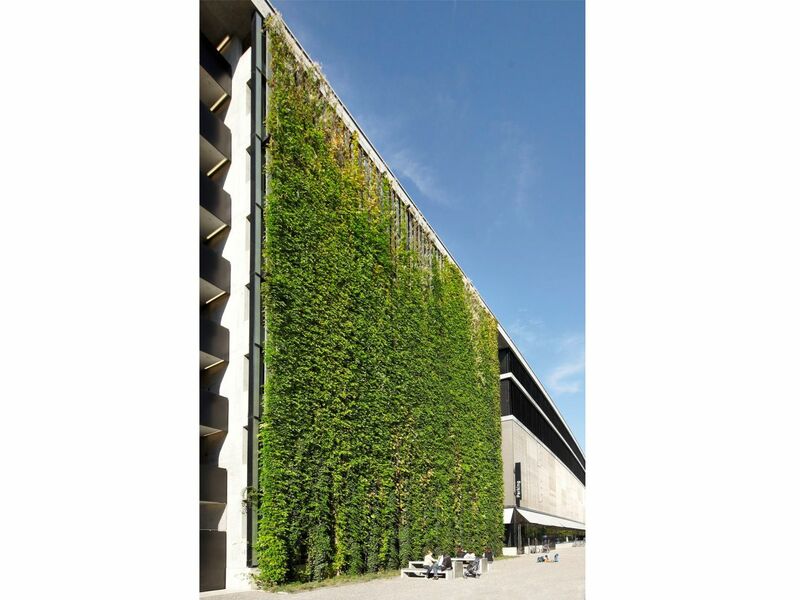 Greenroofs.com Project of the Week 5/21/18 video photo credits: Courtesy of Jakob Rope Systems; Sihlcity; and collage of 1951 photo from ETH-Bibliothek Zurich, Picture Archive and 2016 photo by zhdamalsheute viaï¿½Zurich – damals und heute. 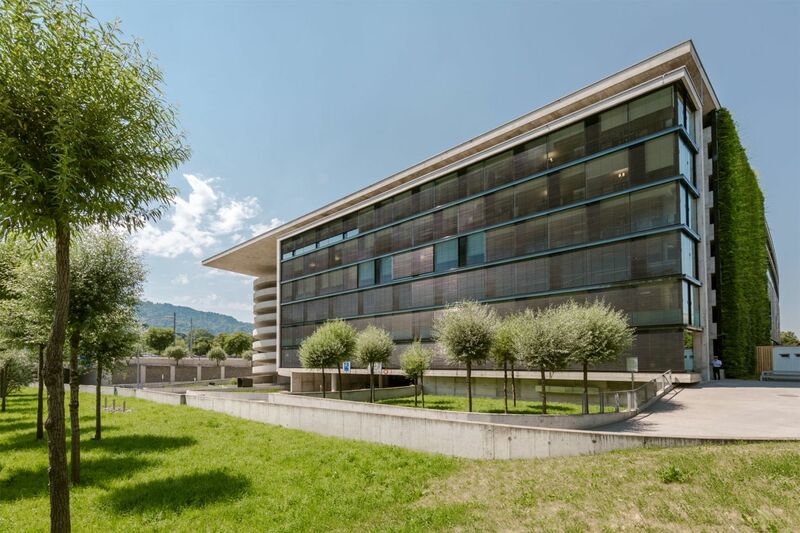 See the project profiles from theo hotz partner architekten and Jakob Rope Systems. 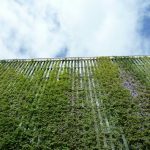 Read the Greenroofs.com Project of the Week for May 21, 2018: Sihlcity Shopping Centre Living Facade by Linda S. Velazquez on Greenroofs.com. 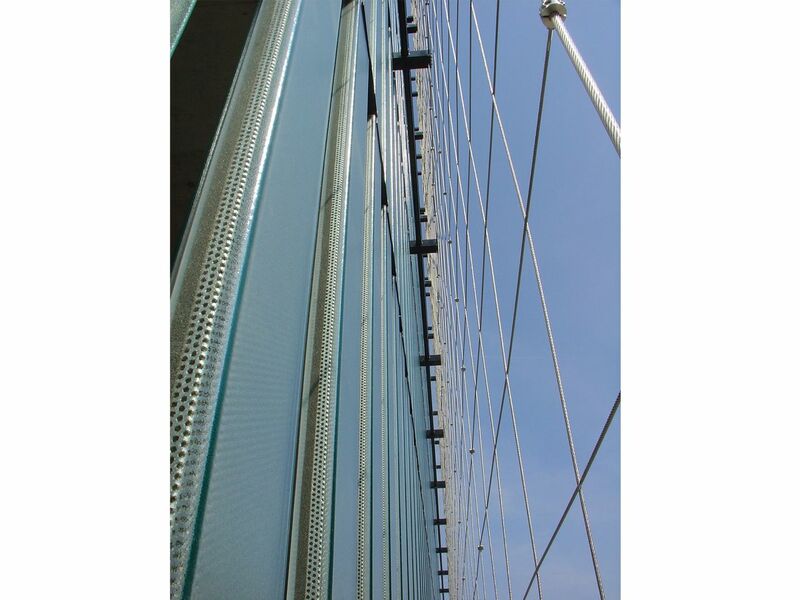 Learn about Jakob Rope Systems in The Greenroof & Greenwall Directory and more about their stainless steel Webnet. 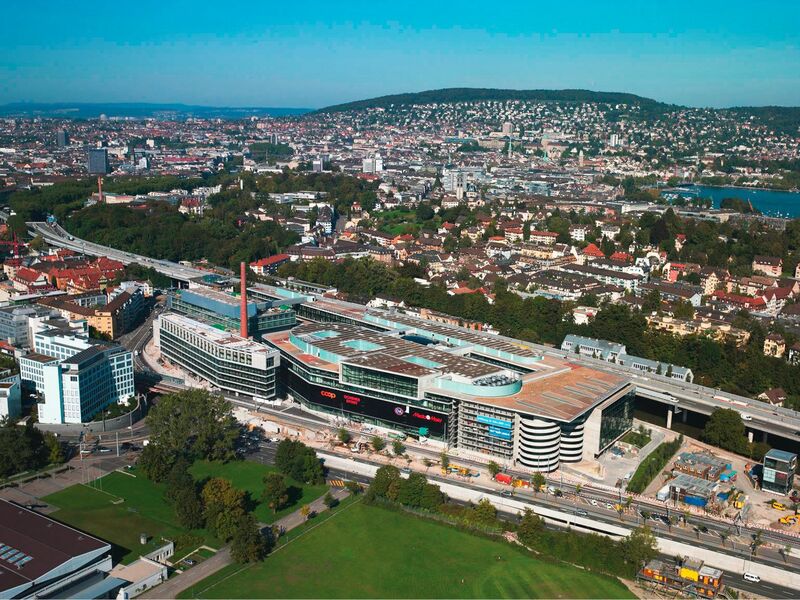 Sihlcity is a shopping mall in Zurich in the Wiedikon district, built on the grounds of a former paper mill, Papierfabrik Sihl, near the Sihl River. Founded in 1836, production came to a standstill in 1990. New construction and preservation of the site’s industrial heritage started in 2003. 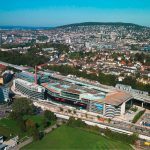 Inaugurated in the spring of 2007 and stretching over an effective area of approximately 100,000 m2, Sihlcity is one of Switzerland’s largest and most advanced shopping and leisure complexes. Planned by architect Theo Hotz and built at a cost of approximately CHF 620 million, the large shopping centre attracts 20,000 visitors a day, offering a broad range of shops, restaurants, entertainment venues, cultural events, a Four Points Hotel, chapel, offices, and living spaces. Four former buildings of the old Sihl paper factory were preserved, and the entire complex is covered in extensive greenroofs. “Four factory buildings were carefully restored: the former Ausrusterei (sheeting and packaging centre), which today offers space for cultural events; then naturally also Sihlcity’s distinctive landmark – the 60-metre high chimney at Kalanderplatz, at the heart of Sihlcity; and finally the Kalandergebaude (‘calendar building’) and the former paper warehouse, both of which were built in the 1950s and have been effectively integrated into the new group of exposed concrete buildings on the northern side of the central square. Together with the chimney and the Ausrusterei, they form a type of pedestal for the new construction volumes, the cantilever extensions of individual buildings even accentuating this pedestal effect. The facades have a layering theme with the effect enhanced by the horizontal concrete bands and glass and metal membranes,” (Sihlcity, Architecture). 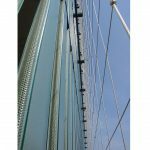 Jakob Rope Systems participated in several facets of this project which represents a landmark from an architectural point of view. 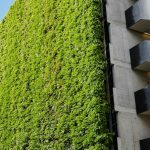 The eastern facade of the parking garage, with a capacity of 850 cars, was equipped with a green wall planned by Jakob AG, and the southern facade of the same building was covered with a stainless steel net across a large surface. In addition, Webnet structures were prominently used in the hallways of the shopping center. 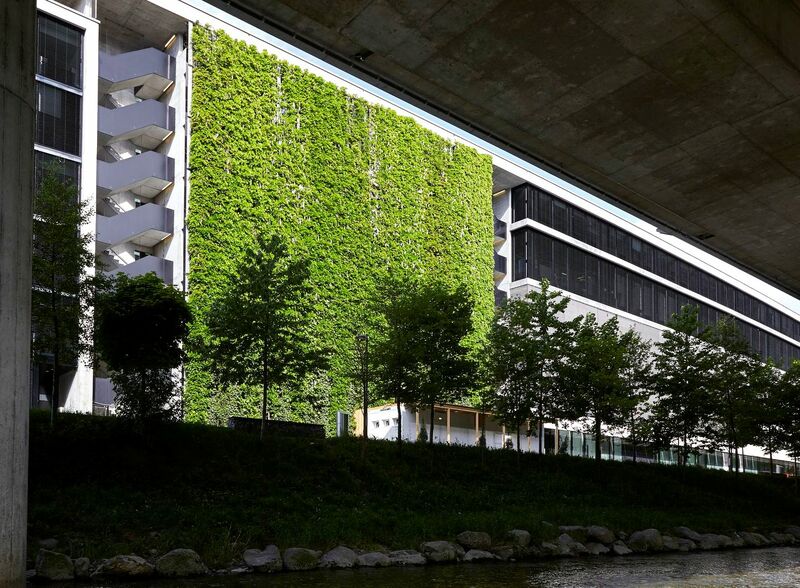 With a height of 23 meters and a width of 25.5 meters, the green wall of the parking facility at Sihl City represents a category of facade greening projects whose sheer size and resulting loads made it impossible to apply standard solutions. 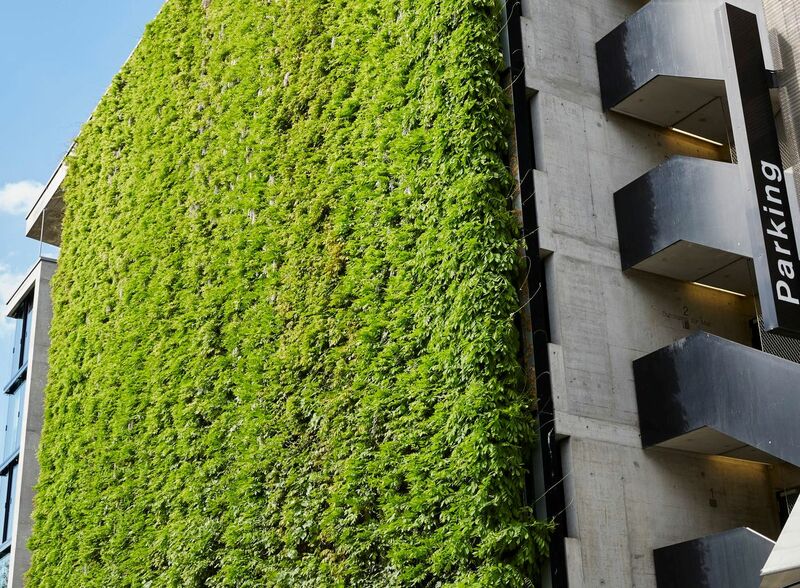 Jakob designed the training systems in cooperation with planners from Raderschall, a Meilen-based landscape architecture firm, and implemented this facade greening task as a subcontractor. The scope of delivery included the planning and supply of the training systems but also their installation on site by experienced Jakob technicians. The relatively wide-meshed training structure, formed by vertical and horizontal ropes of various thicknesses, is suspended at a distance of 70 cm in front of the eight-story high sectional-glass lined eastern facade of the parking facility. 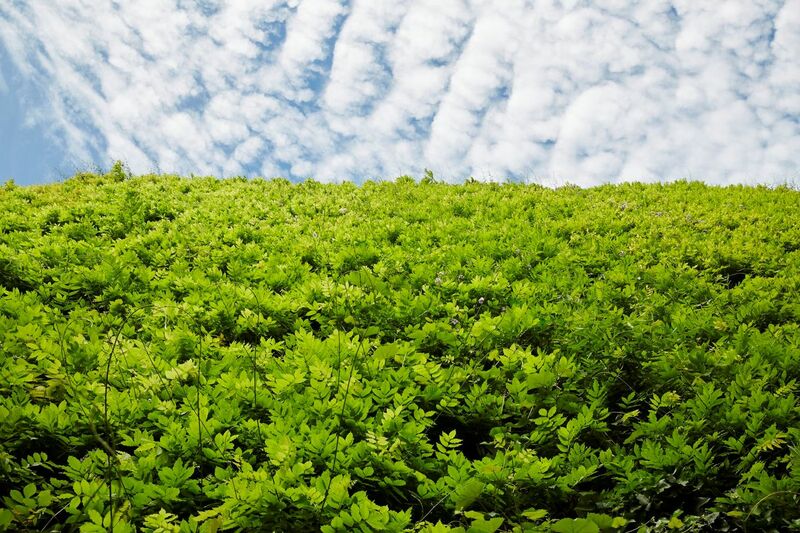 This spacing was designed in order to provide sufficient growing space for the plants – in this case mainly Chinese wisteria (Wisteria sinensis) and birthworts (Aristolochia sp). 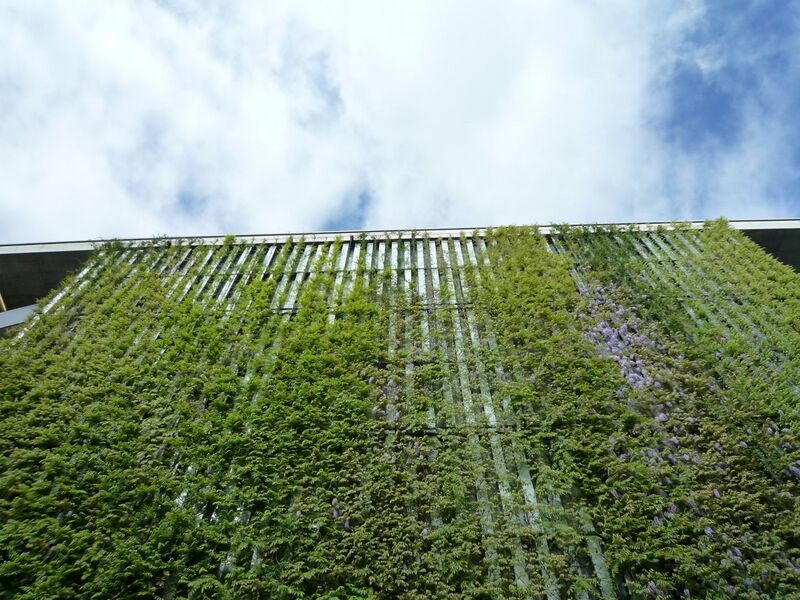 After four years, the car park’s eastern facade was hidden under a blanket of lush, verdant growth. Especially designed, rugged steel spacers permanently connected to the supporting structure of the building ensure safe anchorage of the ropes. 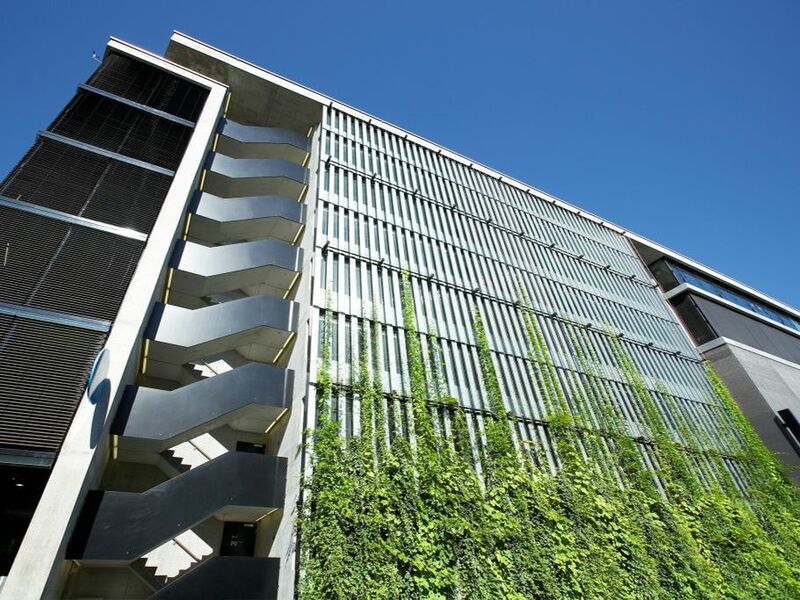 The distribution of the spacers, mounted to the slabs of the second, fourth, sixth, and eighth floors, follows a clear-cut grid pattern that matches the facility’s facade design which is characterized by a vertical stripe pattern. The same applies to the vertical ropes of the training structure which optimally matches the graphically strong aspect of the facade. 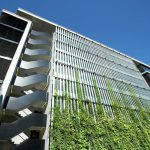 While the green wall on the eastern facade of the parking garage is particularly remarkable for its sheer size, the curtain over the building’s southern facade with Webnet represents a hitherto unique application of this product. It is impressive with regard to both design and cost-effectiveness. For this facade, architect Theo Hotz wanted a “skin-like,” large-area structure that would preserve the original character and aspect of this sober and practical building to the greatest possible extent. A fine-meshed stainless steel net turned out to be the optimal solution of this task. Viewed from a distance, the Webnet appears here like a film tightly stretched over the edges of the fairfaced concrete building. Only a close view reveals the fine-meshed structure of the stainless steel net which is very unobtrusively attached to the front surfaces of cantilevered floor slabs. A unique visual effect is also created by the Webnet on the internal facade of the parking garage. Here, the visitor is offered a largely unimpeded view which prevents the claustrophobic feeling that many people experience inside parking facilities. And to comfort more anxious souls, the external perimeters of the floors are additionally secured by a solid railing arranged in front of the Webnet curtain. Thanks to Webnet, Theo Hotz was able to design a facade that is not just architecturally unique. 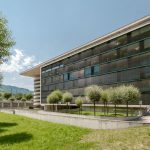 The solution, implemented at relatively low cost, is also convincing from the cost-effectiveness point of view – not least because of the low maintenance costs of the stainless steel net. 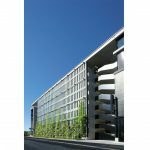 Almost as remarkable as the Webnet facade of the parking facility is the design of the stairways inside Sihl City, where stainless steel nets replace the conventional banisters. This applies especially to the spiral staircases whose cores are secured with net stockings. The stockings are attached to the concrete ceiling of the staircase with a metal hoop and held in shape by vertically arranged stainless steel ropes running along the internal surface and fixed to the lateral surfaces of the slabs and steps. The seamless nets, finished at the factory, were installed on site in record time by Jakob AG technicians. Cost considerations also influenced the choice of Webnet at Sihl City, but in addition to the price advantage, the architect was fascinated by the possibility of securing a flight of stairs with a minimum amount of material without compromising the lucid and pure appearance of the architectural assets. Quite to the contrary: the tightly stretched stainless steel stocking visually emphasizes the cylindrical form of the central core, an effect that could not be achieved with a conventional banister. 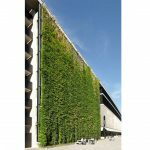 Jakob Rope Systems was able to implement several installations at the Sihl City Shopping Centre that play a key role in the design of the facility. 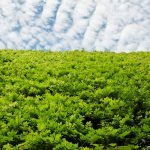 These features clearly illustrate that the company’s products not only inspire aesthetic innovations, but also offer cost-effective benefits. 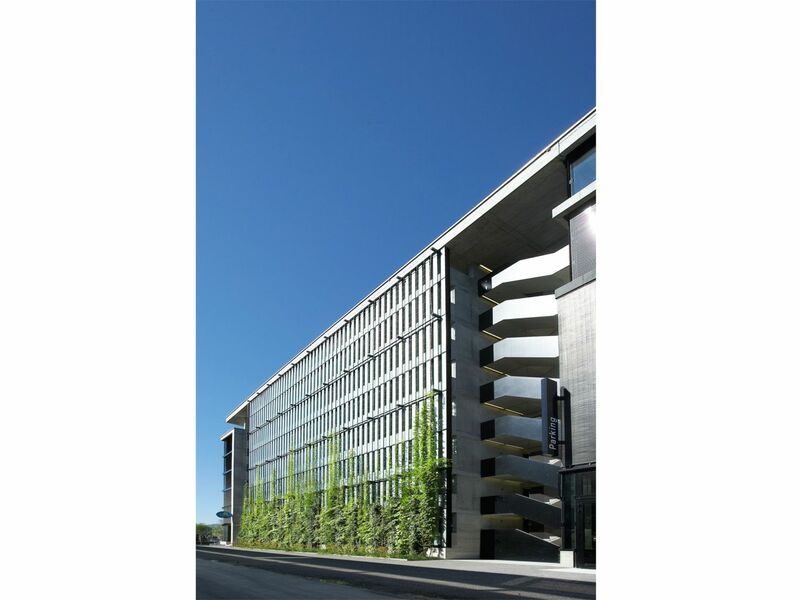 Awards: European Shopping Award 2008, recognition for good building of the city of Zurich 2006 – 2010, and Award for good construction of the canton of Zurich 2013. 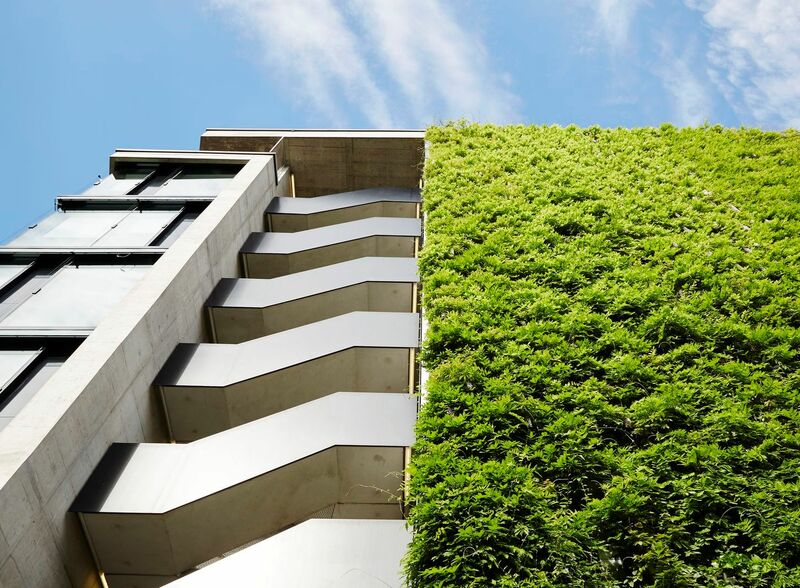 Sihlcity is a great example of a meaningful reutilization of a former industrial wasteland with both repurposed and new buildings, along with a beautiful living facade.